In English grammar, a pronoun is a word that takes the place of a noun, noun phrase, or noun clause. The pronoun is one of the traditional parts of speech. A pronoun can function as a subject, object, or complement in a sentence. Unlike nouns, pronouns rarely allow modification. Pronouns are a closed word class in English: new members rarely enter the language. To understand how to recognize and correctly use pronouns, it can be helpful to review the types of pronouns that exist in English. They always identify nouns, such as: I can’t believe this. The writer does not know what this is, but it exists. They often describe animals, places, or things but they can also describe people, such as: This sounds like Mary singing. They stand alone, distinguishing them from demonstrative adjectives, which qualify (or modify) nouns. Everyone did as he pleased. Both of us match the donation. Many of the indefinite pronouns can function as determiners. When immediately followed by a noun, whose, which, and what function as determiners or interrogative adjectives. When they start a question, interrogative pronouns have no antecedent, because what they refer to is precisely what the question is trying to find out. Reflexive pronouns, which have the forms myself, ourselves, yourself, yourselves, himself, herself, itself, oneself, and themselves, are essential to the meaning of a sentence. "He wondered, as he had many times wondered before, whether he himself was a lunatic." - George Orwell, "Nineteen Eighty-Four"
Intensive pronouns have the same forms as reflexive pronouns: myself, ourselves, yourself, yourselves, himself, herself, itself, oneself, and themselves. Unlike reflexive pronouns, intensive pronouns are not essential to the basic meaning of a sentence. Note that personal pronouns inflect for case to show whether they are serving as subjects of clauses or as objects of verbs or prepositions. All the personal pronouns except you have distinct forms indicating number, either singular or plural. 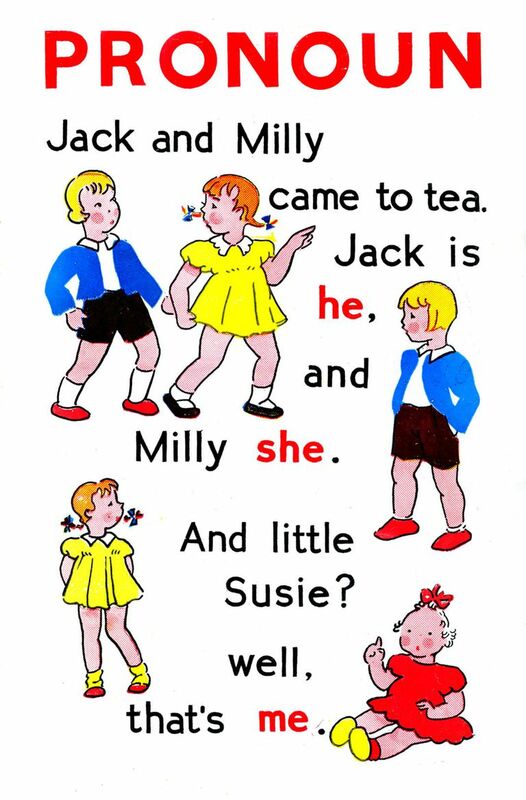 Only the third-person singular pronouns have distinct forms indicating gender: masculine (he, him), feminine (she, her), and neuter (it). A personal pronoun (such as they) that can refer to both masculine and feminine entities is called a generic pronoun. A possessive pronoun can take the place of a noun phrase to show ownership, as in, "This phone is mine." The weak possessives (also called possessive determiners) function as determiners in front of nouns, as in, "My phone is broken." The weak possessives are my, your, his, her, its, our, and their. In contrast, the strong (or absolute) possessive pronouns stand on their own: mine, yours, his, hers, its, ours, and theirs. The strong possessive is a type of independent genitive. A possessive pronoun never takes an apostrophe. Some usage guides insist that each other should be used to refer to two people or things, and one another to more than two. "Spaghetti at her table, which was offered at least three times a week, was a mysterious red, white, and brown concoction." - Maya Angelou, "Mom & Me & Mom"
The standard relative pronouns in English are which, that, who, whom, and whose. Who and whom refer only to people. Which refers to things, qualities, and ideas—never to people. That and whose refer to people, things, qualities, and ideas. What Are the Interrogative Pronouns in English?